Just when you thought Portland’s point guard rotation was back to normal with Steve Blake returning to the floor, along comes a Brian Skinner pick. When the Los Angeles Clippers big man put a body on Blake with about five minutes left before half, a yelp and cringe by Blake said it all. Not sure what hurt more – Blake’s right shoulder or the two air balls he launched during his ten minute stint. Actually, I’m wondering what he was doing out there in the first place. Obviously it was his call to play, but it was Nate McMillan’s decision to start him. Would Blake have re-injured his shoulder if he came off the bench? Perhaps. 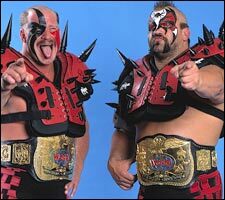 But right now, the tag team of Sergio Rodriguez and Jerryd Bayless are self sufficient enough to hold down the fort for a few more games. If McMillan is going to put faith in his two backup point guards, it might as well be during this stretch. Take Sergio for example. Rodriguez passed up a wide-open three early to find Joel Przybilla all alone under the basket, and his over-the-head-no-look-pass to Greg Oden two quarters later was about as sick as a dish comes. A little stylin’ and profilin’. He played smart. Maybe Sergio’s numbers aren’t going to blow you away (7 points and 5 assists in roughly 17 minutes), but combined with Bayless’ performance the two are holding down the point. Chances are Jerryd started the game thinking he’d be lucky to even sniff the court. But as we all know about the NBA, injuries and opportunities go hand-in-hand. Much like Sergio, his final stat line isn’t All-Star worthy either (5 points and 6 assists in just over 22 minutes), but the fact is the two point guards only combined for two turnovers, and that is solid. And while so much is made of Bayless’ aggressiveness and his barking after a bucket, what about his on-court chemistry with Oden? It seems at least once a game, the two rookies are in sync with an alleyoop or quick dish for a dunk. They have good chemistry together. It’s nice to see both Sergio and Jerryd taking some ownership at the point. In other words, take your time Steve. Take your time. Shameless Plug: Couple more weeks to go to the trade deadline is officially upon us. So as we wait to see what takes place in Portland, teams like Cleveland prepare for another postseason run. But will they make a move? I caught up with Cavs head coach Mike Brown last week – along with Ben Wallace – and was curious what the approach is when names float around in the rumors, as they are prone to do this time of the season. The story is running in full over at HOOPSWORLD. Portland played phenomenal to open the game. They put it away late. But somewhere in-between Greg Oden registering his first two points in the NBA in the first quarter and Rudy Fernandez’s spinning-jumper in the lane in the fourth, the Blazers nearly tanked it. 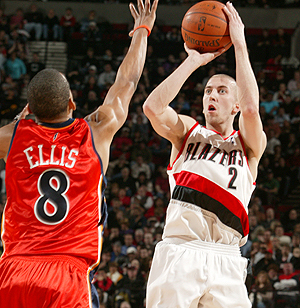 Thankfully a Steve Blake corner-three and career-high 25 points for Fernandez saved another road win. This winning on the road thing is starting to become a habit. Let’s jump inside – and outside – the boxscore…. -Three points in roughly 16 minutes is nothing to write home about for Greg Oden. Here’s what is though: that he played injury free. That’s what’s most important right now. He looked awkward on offense. He intimidated on defense. But Oden fit perfectly into the second unit, and once he gets his legs under and timing back, the second unit is going make some folks around the Association take notice – unless they haven’t already with Rudy Fernandez and Travis Outlaw putting in work. 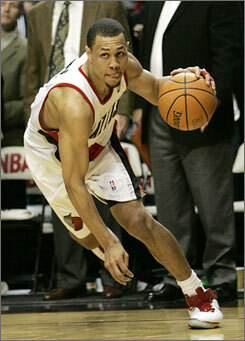 –Brandon Roy (back) may have been gimpy heading into the game, but you never would have thought so watching him play. Seeing Roy (22 points) and Dwyane Wade (36 points) go head-to-head in stretches would have made Muhammad Ali and Joe Frazier blush. It was blow for blow. Might have to call that one a draw. –LaMarcus Aldridge tends to get lost in the Roy-Oden-Rudy shadow but he shined on Wednesday night. You may never see a more hard-earned and aggressive 14 points and 7 rebounds in your life. Blake hit the three. Roy was Roy. Rudy was amazing (again). But Aldridge’s effort shouldn’t go unnoticed as the player of the game against Miami for another strong showing. He punched the clock. – Joel Pryzbilla was solid. Along with Aldridge, Joel cleaned up the glass early and helped get easy points in the paint in the first. He finished with 7 points and 10 rebounds. Very solid. But here’s what’s most impressive: he played just under 22 minutes and didn’t commit a single foul….a single foul. -What can we say about Rudy Fernandez that ESPN’s Jon Barry didn’t repeat over and over and over during the nationally televised game. For 48 minutes, Barry raved about Fernandez to no end, leaving viewers to recite the “this guy is fearless” mantra until Barry calls another Blazers game this season. Now the middle-Barry brother knows what Portland has already come to know about Rudy in this short season. –Play Of The Game: Honorable mention goes out to Nicolas Batum for his block on Wade in the first quarter. Kid never gave-up on the play. Sergio Rodriguez’s lob to Rudy for a dunk in the fourth quarter also gets a nod. Yet it was Rudy’s spin move and jumper in the lane with 44.9 seconds left that put Portland up 98-92 and gave Rudy 23 points that was the play of the game. Steve Blake may have an argument, but this was Rudy’s night. Does Portland Need Another Veteran? Nate McMillan likes his veterans. Kevin Pritchard likes his veterans. Steve Blake is likeable. So is Joel Pryzbilla. But does that mean Portland wouldn’t love benefiting from another veteran on the roster? The thought crossed my mind while I was writing a “Free Agents For Hire” piece for HOOPSWORLD that is running today. And while the list of free agents – veterans of course – may not exactly fit Portland’s culture (although guys like Antonio McDyess, Lindsey Hunter and P.J. Brown are as solid as they come), I can’t help but think about a phrase McMillan tended to repeat at the end of last season. He said then the Blazers could use more experience. At least that was his stance heading into the offseason. All Portland did during the summer was get younger. I’m not saying James Jones (now with Miami and on the shelf with a jacked-up wrist) was the end-all-be-all. He had to go to turn the job over to guys like Martell Webster and Travis Outlaw. But you have to agree Jones had a knack for corner three-pointers, providing on-court leadership in limited time and being light-hearted in the locker room. Jones is just an example. He’s what you’d want in a veteran. The trouble is where do you put another player? Minor details. 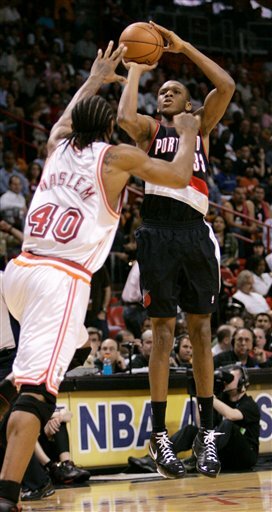 Let’s answer the first question before we move on to the nitty-gritty….does Portland need another veteran?